Serving the health needs of the residents of Northwest Ohio and Northeast Indiana is Parkview Health with more than 10,000 employees. One of those employees, in the biomed department, has been with the health system for 38 years. Mitch Hoffman, CBET, has enjoyed a long career as an HTM professional. “What got me interested in HTM or biomedical engineering was the curiosity of electronic equipment in the early ’80s,” Hoffman remembers. “At this time, I was working in facilities right out of high school. [I] actually started college studying to be an accountant. But, when I saw the hospital start this new department, where the techs would work on Physio Control Lifepak 4 defibs, that were huge and heavy and had a capacitor the size of a toaster, and heart monitors that were also huge, the department caught my eye. So, I switched my major to digital electronics in college,” Hoffman says. In addition to working as a biomed for 34 years, Hoffman worked in facilities for about two years and also worked as a facilities biomed supervisor for about two years. He didn’t care for the supervisor position and went back to being a biomed. 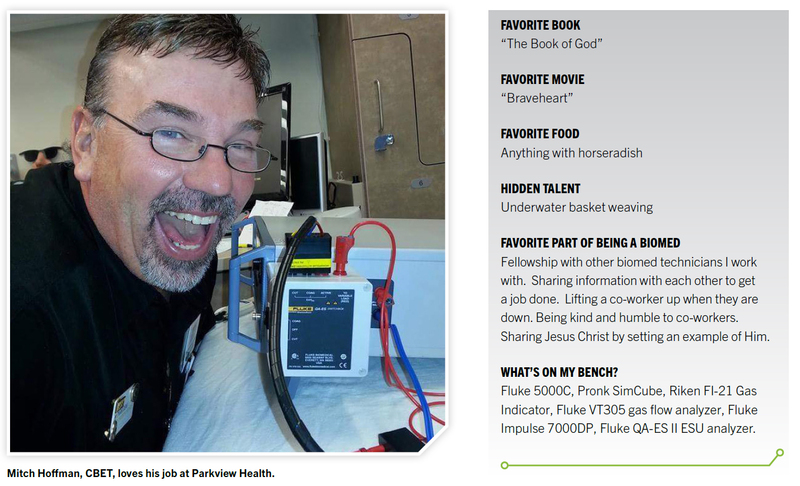 “Parkview Health System is the largest employer in northeast Indiana employing over 10,000 employees. To get that big, you have to keep expanding and adding/updating hospitals to the overall system. In the 2008 time-frame, Parkview began building, at a new location, a hospital to replace the current one that was built in the ’50s that I was assigned to,” Hoffman says. “So, I was maintaining the current old building [and] attending pre-construction meetings. I recall an early meeting I attended, when looking at the blueprints, and not seeing a biomed shop. I asked the architect; ‘Where is the biomed shop?’ The architect replied ‘What is biomed?’ After I explained, it was added to the next drawings,” Hoffman remembers. “Also, at the time, I was maintaining the medical equipment at another location in the same health system, 20 minutes away. Fortunately, I did have the help of another biomed tech at the new facility being built, during the construction process. [It] took some of the stress off me for sure. While taking care of the old hospital, the hospital 20 minutes away, the other tech and I managed receiving over 1,000 pieces of new medical equipment that was arriving in batches to the new hospital,” Hoffman adds. Hoffman says they had a receiving area where all the equipment was sent where they would unbox, test, tag, inventory and enter the equipment into the management software system. The day of the switch over from the old facility to new facility, more techs arrived to help with the staging process of bringing the equipment from the old facility that was going to be reused at the new facility. “It was basically controlled chaos,” Hoffman recalls. Hoffman has also helped out a general surgeon who provides medical services to people in Haiti. Hoffman met Dr. Chamberlain when he removed Hoffman’s gallbladder and appendix. During the surgery, the heart monitor quit functioning. “They knew I was OK,” Hoffman says. “So, the anesthesia doctor said ‘page biomed.’ The nurse said ‘we can’t, he is on the table.’ (I was the only biomed at the hospital. This was before we were a health system, so I had no backup). They went to another room and got another monitor and everything was fine. They told me about this after my surgery,” Hoffman adds. Today, the surgeon is semi-retired from Parkview Health System, according to Hoffman. “I have known Dr. C. for over 20 years. He saw me working on medical equipment in the OR. When he would go on his mission trips he would hook up with me and ask if I had any in-hospital medical equipment that the hospital was not using anymore that he could take on his trips. The hospital was able to supply him equipment from time to time. I would verify that the equipment was functional and off it would go,” Hoffman shares. Hoffman says that Chamberlain recently shared how a Valleylab electrosurgical unit was being used on patients and just keeps working in all kinds of temperatures and humidity. “How many lives were saved would be too many to count,” he says. “He told me of a story of a SPO2 monitor, that I provided from the hospital, that was being used on a patient during surgery and he and the anesthesia doctor noticed the patient’s blood saturation dropping and realized the patient needed oxygen. They were able to bring the patient back because of the monitor we donated. From time to time, the surgeon will bring back equipment for me to repair, if possible. One of the most recent pieces was the multiparameter monitor that I submitted to ‘The Vault’ section and was used in December 2017 edition of TechNation,” Hoffman says. Hoffman has found special meaning in his faith. It has been personally transforming and has been another way to provide healing besides working to help patients on the job. “Hobbies would be riding my bicycle throughout the year weather permitting. I’m very active in my church. I lead the men’s ministry and am faithful to Jesus Christ. I have three children, three grandchildren, a wife of 24 years. I love to read the Bible, watch sports and play a little golf,” Hoffman says. “About five years ago, I started attending a local church knowing that there was more to this life than I was experiencing. God got ahold of me and I haven’t looked back. My relationship with my family has improved drastically because of my devotion to my Father and the intimate relationship I have with Him,” Hoffman adds. “One result of God’s love and change, He made in my life, was witnessed a few Christmases ago. My relationship with my oldest daughter had been strained due to my arrogant and selfish attitude. God called me out on it and I prayed for humility. God worked with me on that along with going to people in my life that I have wronged by lies, etcetera and asking for forgiveness including my daughter. The relationship with her became so much better because of Him. That Christmas morning while opening presents, she handed me a letter and asked me to read it alone later. It was incredible. True evidence of what God can do when you let Him work through you,” Hoffman says. This biomed has been a part of healing patients and a lot more.